You'll receive an email copy once everyone has signed. Discover how DocuSign can benefit your sales operations and close deals faster. How do I get back to my document? 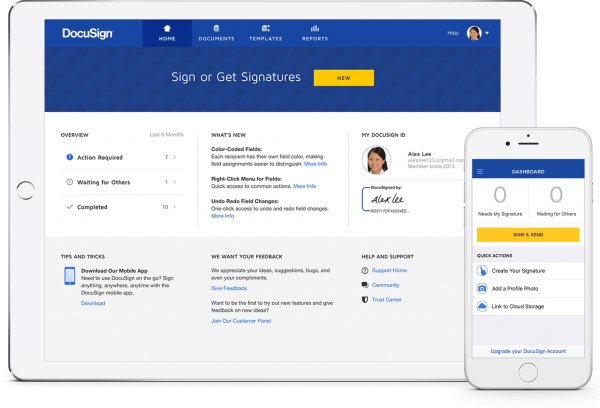 Once all signers have finished signing the DocuSign document, you'll be notified via email. You can access the document by opening the completed notification email that is sent to you once all signers have finished signing. Will this document be saved to my DocuSign account? Yes, if you already signed up for a DocuSign account, go to www.docusign.net and log in with your email and password. Once logged in, select the Documents tab and you will see your documents. Does the person who sent this to me know that I've signed and am done? Once all signers have finished, the sender will receive an email notification that the document is completed. Who do I contact with questions about this document? DocuSign sends email notifications on behalf of its users. You can simply "reply to" the email notification to contact the sender of the document.